iPhone X Vs Samsung Galaxy S9 – Which One You Should Buy? Apple and Samsung always strive to introduce high-end innovations. With each year launch, they give tough choices to the buyers. Be it design, performance, processor or other parameters, they have always been neck-to-neck. The only significant difference they own is, OS – iOS and Android. 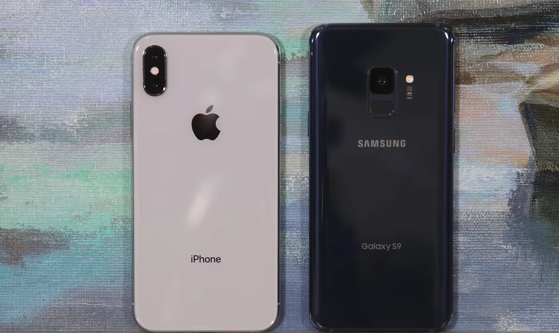 With the release of iPhone X and Samsung Galaxy S9, it has become a bit difficult to choose among iPhone X and Samsung S9. If you are also one of them who is juggling between these two options, we will assist you to compare iPhone 10 and Samsung 9 in a glimpse. iPhone X’s bezel-less design is now somewhat similar to the sleek bezels of Samsung Galaxy S9. With Galaxy S9, Samsung introduced bezels only at the top surrounding sensors and camera. Following the design of the precedents, iPhone X is having the notch for sensor and camera. But, Samsung does not have one, although other Android smartphones do have the notches. Akin to iPhone X, Samsung Galaxy S9 has introduced Face ID and iris unlock. But offering the more of ease, Samsung S9 introduced the fingerprint scanner at the rear which is serving the utmost convenience. While Apple payments are made easy with Face ID of iPhone X, which is not possible for making Google Payments with S9. The grip of iPhone X and Samsung S9 is justifying its own price. iPhone X has glass at the rear while Galaxy S9 has the premium material. With IP67 rating, iPhone X has little low dust and water resistance, while Galaxy S9 is leading with the rating of IP68. iPhone X with glass at the back supports wireless charging, however, Samsung Galaxy S9 with no glass back supports wireless charging. iPhone X allows Lightning adapter, since there is no headphone jack, but Galaxy S9 owns the headphone jack. Tuned by AKG, Samsung S9 speakers are front facing which also support Dolby Atmos for enhanced sound effect. However, iPhone X’s speakers are never lesser than that of any smartphone when it comes to sound quality. Talking about the display, both iPhone X and Samsung Galaxy S9 is capable of streaming HDR content. When the dimensions and resolutions are concerned, Samsung Galaxy S9 with 5.8 inches AMOLED screen has higher resolution of 2960 x 1440 with 570 ppi, while iPhone X with 5.8 OLED screen has resolution of 2436 x 1125 with 458 ppi. The baseline is, both, iPhone X and Samsung Galaxy S9 are boasting the fabulous and best-in-class display units. Samsung S9 is offering great color vibrancy and saturation, simultaneously, iPhone X True Tone technology is excellent which adjusts the color temperature according to the surroundings. iPhone X and Samsung Galaxy S9 has different OS which can never be compared. iPhone X with iOS and Samsung S9 with Android performs at their best. Galaxy S9 chipset is Qualcomm Snapdragon 845 / Exynos 9810, whereas iPhone X chipset is Apple A11 Bionic. And, this is why both the devices works swiftly with the apps available on their respective stores. Looking onto their RAM, iPhone X has 3 GB, while Galaxy S9 has 4 GB. However, RAM performance is different for both the OS, so the difference between them doesn’t impact their performance at any instance. The storage availability in both, iPhone X and Samsung Galaxy S9 ranges between 64 GB to 256 GB. But, Samsung S9 with a micro SD slot offers expandable memory option which is up to 400 GB. Both, iPhone X and Samsung S9 has 12 MP camera at the rear, but what actually makes them different is – lenses. iPhone X has the dual-lens with wider lens of f/1.8 aperture and telephoto lens of f/2.4 aperture, whereas, Galaxy S9 has the lens with variable aperture of f/1.5 – f/2.4. And, again they both support OIS (Optical Image Stabilization). The wide lens of iPhone X makes it to capture high quality images without any distortion. 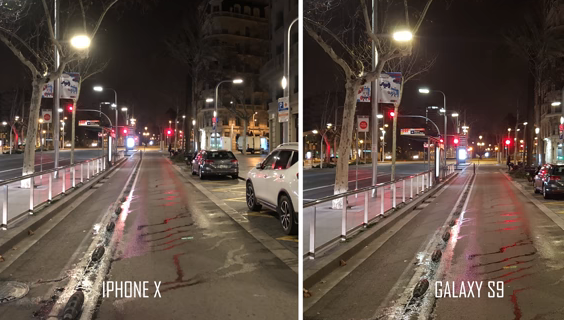 Be it a dim-light surroundings or day-light, iPhone X makes the perfect shot by adjusting with the surroundings. When talking about Galaxy S9, the single lens is restricting the zoom diversity. However, its variable aperture lets it adjust and allow the light to reach the sensor for HD pictures. Down the line, both the phones are giving tough competition in aspect of camera performance. No matter, it is a dim-light surrounding or immense light area, iPhone X and Samsung Galaxy S9 are capable of clicking the detailed pictures. However, the overall picture quality makes iPhone X to win, as Samsung S9 is lagging due to its overexposing and intense processing feature. Now, considering its video quality, the camera app of S9 offers number of features and options. It can shoot slo-mo video at 960 fps, while iPhone can shoot at 240 fps. And, yes, both phones can make 4K video at 60 fps. No doubt, iPhone X has been the most expensive smartphone in the entire range of Apple’s smartphones. For different variants, its price ranges starts from $999 and varies up to $1200. While, Samsung Galaxy S9 variants ranges from $861 to $1084. iPhone X Vs Samsung Galaxy S9 – Who Wins? For their respective OS, iPhone X and Samsung Galaxy S9 holds the utmost best-in-class features and performance. When evaluating their overall improvements in contrast to their predecessors, iPhone X brought the revolution, whereas Samsung Galaxy S9 made a very little upgradation. The price and additional features like microSD, USB-C and headphone jack within Samsung Galaxy S9 definitely gives it a win-win factor, while the camera of iPhone X gives it a plus one. Well! The truth is, nothing can stop iOS lovers to buy iPhone X and Android lovers to buy Samsung Galaxy S9. Previous How IoT Can Serve As An Entertainment Source via Xbox?